It has been our pleasure to serve the travel community over the past 60 years. Thank you for trusting us with your vacation dreams! We want you to know that we truly value your business and appreciate the opportunity to assist you in making each trip the best one yet. We look forward to many more years of working with you, and wish you a wonderful Summer. Prices are per person based on double occupancy. Taxes, Fees and Port Expenses of $110 per person (sailing on the Ruby Princess) and $135 (sailing on the Grand Princess) are additional. Pricing is subject to change. Some restrictions apply. *100 deposit + coupon book starting 5/15/2017 through 5/22/2017. Prices are per person based on double occupancy. Taxes, Fees and Port Expenses of $295.00 per person (sailing on the Pacific Princess) and $175.00 per person (sailing on the Crown Princess) are additional. Pricing is subject to change. Some restrictions apply. *$100 deposit plus coupon book starting 5/15/2017 to 5/22/2017. Offers subject to change without notice. Minimum night stays, select travel dates and other restrictions may apply. *Sample prices are per person based on double occupancy and may change due to fluctuations in airfare. Sample travel dates are from 6/21/2017 to 6/26/2017. For full terms of this offer, visit www.morrismurdock.com/delta. Offers subject to change without notice. Minimum night stays, select travel dates and other restrictions may apply. *Sample prices are per person based on double occupancy and may change due to fluctuations in airfare. Sample travel dates are from 9/17/2017 to 9/25/2017. For full terms of this offer, visit www.morrismurdock.com/delta. Prices are per person based on double occupancy. Taxes, Fees and Port Expenses are additional. Pricing is subject to change. Some restrictions apply. *Shipboard Credit for new bookings 5/15/2017 through 5/31/2017. Let Italy feed your senses. Join Chef Libero, as you learn how to buy fresh local produce in Florence and prepare your own pasta for lunch on othis Flavors of Italy trip. Wherever you choose to travel with us, you will experience authentic moments like this, bringing you closer to the heart of your destination. 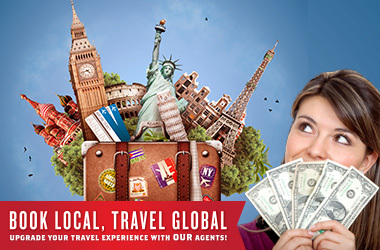 Let Morris Murdock Travel and Trafalgar Tours make your next trip the best one yet. Buona fortuna!